This is the gathering information on who is coming thread. As in previous years please do not amend the initial master summary post. Please add your own post with the information requested and a Mod will add it to the master list before deleting it. Again, do not put chat here as it will be deleted. Put it in the chat thread. 1. How many vehicles on the stand per day. 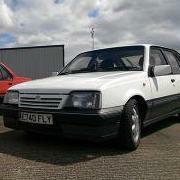 We want to know how many are Mk2 Cavaliers and how many are others, Vauxhall or not. 3. Any caravans/motorhomes/trailers if any, as space may be limited.